The Beginners Level courses are introductory courses. The knowledge provided in the Sunrise Courses helps to establish the basic knowledge needed for the Professional Level courses. At the same time the Sunrise Intermediate Course forms the first 2 days of all professional courses. Thus, all participants of the professional courses have to attend the Sunrise Intermediate Course. In the Expert Level courses we train in the design of different size PV systems for single and three phase applications.Other than in the professional courses we even train you to use software tools. We also offer 6 week software licenses of selected computer programmes. 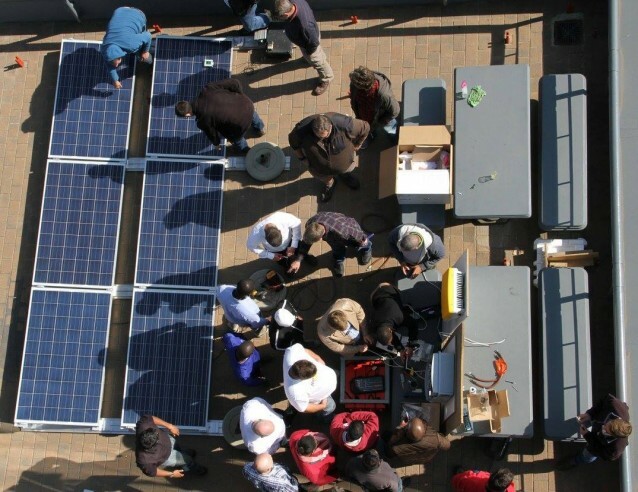 You want to learn how to start or or professionalise your solar power business ? You want to prepare yourselfes for the PV GreenCard solar PV assessment? The Super Solar School is a one week training developed by DGS (German Solar Energy Society) and align with the curriculum of the SAPVIA 5-day Solar PV Installer course. The SuperSolarSchool prepares you to start in the solar business. But we provide you not only with quality training but offer you a broad alumni programme to facilitate your smooth start in the business.